Since its emergence in the last decade, e-commerce has seen tremendous growth and great changes to how businesses are being run. Many have made speculations about the future of e-commerce, and undoubtedly it will play a significant role in the global market. Statista predicts that global e-commerce sales will skyrocket and grow exponentially in coming years, doubling e-commerce revenue within just 5 years. Clearly, e-commerce is set for leaps and bounds in its development. With mobile e-commerce sales expected to constitute over 72.9% of e-commerce sales in 2021, surfing the Internet by just your PC will soon become a thing of the past. Mobile-friendliness will become crucial to e-commerce, and online shopping platforms will have to compete for speed. While social media already plays a key role in our daily lives as of current, it is predicted that it is on the rise to become the core of e-commerce marketing, according to this article. With e-commerce brands already investing in social media, sites such as Facebook and Instagram will surely replace billboards and bus ads in the near future. 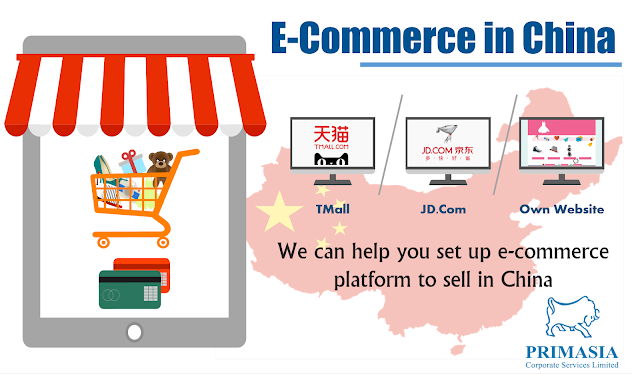 There is much room for growth when it comes to online shopping platforms, and if you’re looking to set up your e-commerce business in China, contact Primasia today for our services, including account set-up, management, accounting, and more! Why not China’s startup community?